Design Holidays have carefully selected only the very best villas and hotels to complete our luxury Cyprus Collection. We are therefore delighted to advise that new in our portfolio is the luxury Aphrodite Hills resort with the most sumptuous luxury villas with pools to rent in Cyprus ! Design Holidays are a preferred travel partner for Aphrodite Hills !! Cyprus is the third largest and most populous island on the Mediterranean Sea. It is situated at the eastern point of the Mediterranean. The island is located to the west of Syria and Lebanon, northwest of Israel, north of Egypt, south of Turkey and southeast of Greece. Cyprus is the perfect blend of exquisite cuisine, culture, warmth, ancient ruins and stunning beaches. The island is the birthplace of the Greek goddess, Aphrodite, surrounded by numerous historic sites, such as the ancient city of Amathus, city ruins and tombs of kings. If you are looking for that perfect holiday in Cyprus, Design Holidays can get you that and more. With over 20 years’ experience, in negotiating with resorts and hotels all over the world, we can guarantee you competitive prices. There are two main airports on the island. The Paphos International Airport (PFO), situated in western Cyprus, 145km from the capital, Nicosia, and the Larnaca International Airport (LCA), situated south-east of the island, about 50km to Nicosia. 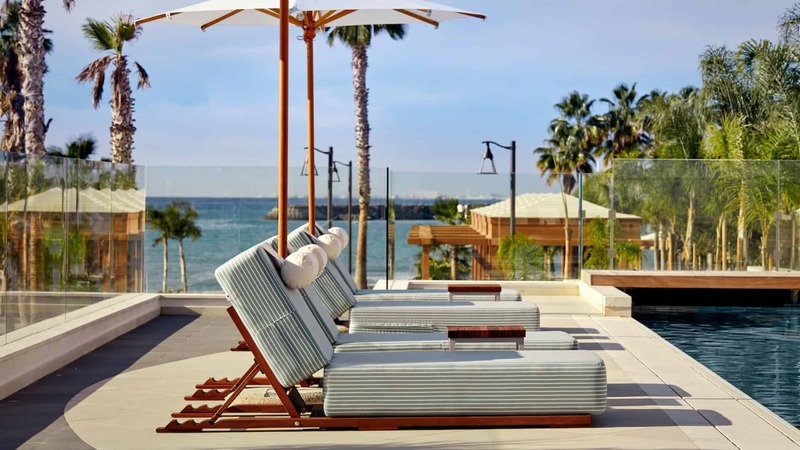 Cyprus is home to some of the best resorts in the world, where medieval and ancient streets meet modern bars and glossy malls. Design Holidays have carefully chosen only the finest villas, resorts and hotels, to give you the perfect holiday. Aphrodite Hills Villas: Aphrodite Hills Villas is a luxurious family-friendly resort, located in the heart of Cyprus, Kouklia, Paphos. Anassa Hotel Resort: Anassa Hotel Resort is one of the most exlusive luxury spas in the world. This exotic spa resort is located on a secluded spot, in the Akamas Peninsula. Between the charming fishing village of Latchi, and the town of Polis. Parklane Resort and Spa: Parklane is an exotic collection, of resort spa located in Limassol. 40 minutes’ drive from Larnaca International Airport. Cyprus is a jewelled Island, filled with numerous destination sites like its fine Byzantine churches. Here are some of the top attraction sited on the island. Hilarion Castle is the ruins of an old Crusader bastion that sits on the Kyrenia Mountain, in the northern part of Cyprus. This village also known as Troodos Massif (Troodos Mountains), is a hilly region in the southwest of Cyprus. The village is filled with cobblestone alleys, traditional houses, and houses some of Cyprus’ most medieval churches and monasteries. Nine of the churches in Troodos village, have been made UNESCO World Heritage Sites. Nissi Beach is among the 7 beaches awarded the Blue Flag designation in Cyprus. It is a 500-metre turquoise sea, located in Agia Napa. Kolossi castle was a former Crusader fortress, located in the south-west point of Kolossi village, 14 km from the city of Limassol. The surrounding area of the castle was once used as a sugarcane plantation. Cuisines in Cyprus is a mix of Turkish and Greek influence. Fresh vegetable, fruits, seafood and meze meals, are common dining options, accompanied with local spirits such as ouzo, Zivania, Commandaria and Cyprus Brandy. Grilled halloumi (brined cheese made from cow and sheep milk), and lahmacun (pizza sprinkled with lamb and herbs) are Cypriot foods that you must eat before leaving the island. Design Holidays will give you the best holiday, at competitive rates for all our accommodation in Cyprus. Contact us today on +44 (0) 1444 87 2200 for information.